Charles B. WEBBER (1741 – 1819) was Alex’s 6th Great Grandfather; one of 128 in this generation of the Shaw line. Charles B Webber was born in Old York, Maine January 1741. His parents were Joseph WEBBER and Mary LEWIS. Charles served in the French and Indian War in 1757 and 1759 and was a 2nd Lt in the Revolutionary War in 2nd Lincoln County, Regiment of Mass. Militia in 1776. He first married Hannah CALL in 1761 in Dresden, Maine. He came to Vassalboro, Maine in 1765 and his daughter, Sarah, was the first white child born in town. After Hannah died in 1782, he married Sarah Smiley. Charles died 20 Nov 1819, age 79y (g.s. Webber Cemetery, Vassalboro, Maine). On Jan 7, 1820, Charles’ sons George and Jeremiah were administrator’s of their father’s estate. In court Feb 8, 1820,. letters taken out in 1819 at the time of his death he was seized of certain real estate, dated March 25 1825, William H. Webber, minor son of Charles. Another source says the father of Charles was John Webber, b 1715 in York, ME, the son of John Webber Sr. and Magdalene Hilton. However, additional sources don’t show a Charles among his children. Hannah Call was born in 20 Dec 1744 in Amesbury, Mass. Alternatively, she was born in Dresden, Sagadahoc, Maine. Her parents were Philips CALL Jr. and Dorothy HADLEY. Hannah died about 1782 in Vassalboro, ME. Sarah Smiley was born on 26 Sep 1747 at Windham, NH. Her parents were Hugh Smiley and Mary Park. Sarah lived in Sidney ME. Benjamine and Jeremiah are hers. Sarah died in 1842 in Vassalboro, Kennebec, Maine. Judith Chadwick? Before 1820 Census? Webber Pond is about 2 miles square. It was been plagued by algae blooms. The settlement of town of Vassalboro commenced in 1760. for ten years only eight families had become residents including those in what is now Sidney that was first included in the limits of Vassalboro. Four families settled on the river front below what is now called riverside. Charles Webber came in 1765, soon after his brother Joseph came. Charles Webber was the first town treasurer of Vassalboro in 1771 and again in 1776; selectman in 1773 and 1792-1796; and the third town clerk in 1776. The fertile, farming town of Vassalboro, next north of Augusta, has the Kennebec river for its western boundary, China for its eastern and Winslow for its northern. Settlements here commenced as early as 1760; but for eight years only ten families had become residents, including all in the present town of Sidney, which was incorporated within Vassalboro’s first limits. April 26, 1771, it was first recognized as a corporate body, and January 30, 1792, Sidney, the part west of the river, was incorporated a town by itself, leaving the present Vassalboro. The three ranges of lots between the river and the gore were surveyed and numbered by Nathan Winslow in 1761. The lots east of it, shown on this map were surveyed and plotted by John Jones in 1774, and designated as the fourth and fifth ranges. These numbers are still generally referred to in deeds. East of the third range Jones established a new line for the western boundary of the fourth range, leaving a strip of land of unequal and irregular width extending across through the town, and referred to in deeds as the Gore. The principal inlet to Webber pond is in this gore, which extends over Cross hill to the southward. Northeast of the town house it is included in the farms of Z. Goddard, Elijah and James Pope and Frank H. Lewis. 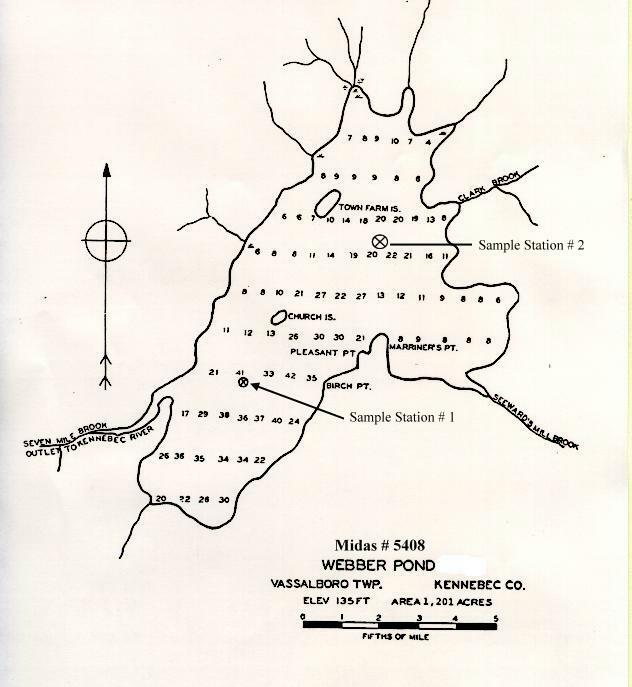 1778 – Joseph Webber was selectman of Vassalboro. 1790 – Charles Webber was helped to lay out the first nine school districts on the east side of the river. The town of Vassalboro has ever stood out boldly and faithfully for the support and maintenance of her schools. In 1790 the town was divided into nine districts. The committee making this division was composed of Reuben Fairfield, Charles Webber, Nehemiah Getchell, Daniel McFadden, Joseph Fellows and John Taber. Alterations were made in the bounds of districts as the convenience of the inhabitants demanded. In 1799 $1,000.00 was raised to build 10 school houses. Military service 1: Revolutionary War – 2nd Lt. in Capt. Dennis Getchell’s 2nd Lincoln County, Regiment of Mass. Militia; Served at Riverton, RI 1777.
also 2nd Lt. in Capt. 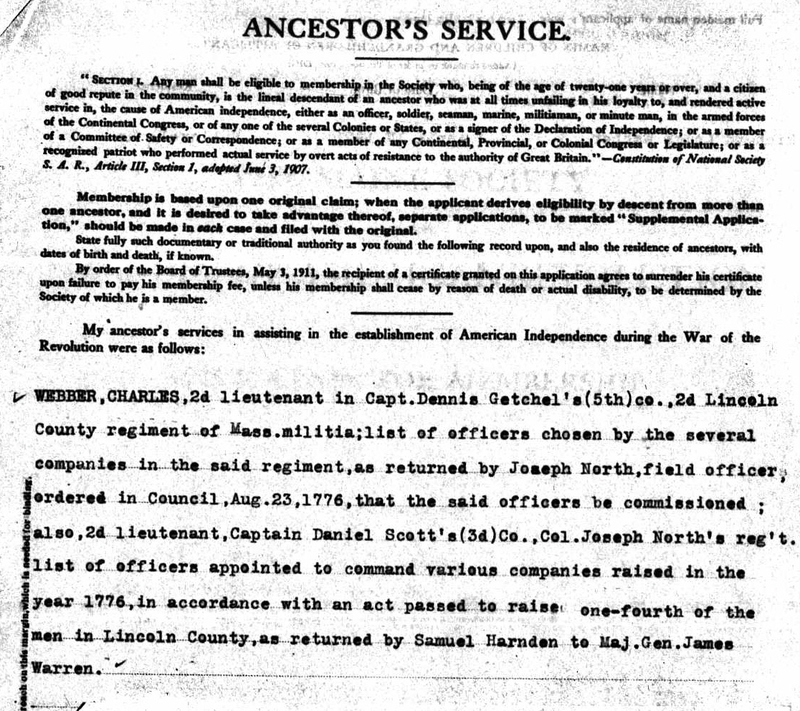 Daniel Scott’s Co., Col. Joseph North’s 2nd Lincoln County Regiment raised in 1776. Leigh Webber, the great grandson of Horatio Nelson Webber and Charles’ 3rd Great Grandson filed this application in 1921. I wonder what this fuss was about? Charles Webber had 91 grandchildren of whom I’ve identified 52. I’m pretty sure Caroline would not have been entitled to any of her grandfather’s pension or land grant. Not only that, but she was only one of Charles’ 91 grandchildren. The first pension law in 1776 granted half-pay for life to soldiers disabled in the service and unable to earn a living. The first pension law based on service was passed in 1818, but it was later amended to make eligible only those soldiers unable to earn a living. The pension act of 1832 allowed pensions again based on service and made widows of veterans also eligible to receive pension benefits. Fires in 1800 destroyed the earliest Revolutionary War pension application records. As a result, pension application papers on file at the National Archives begin after 1800. 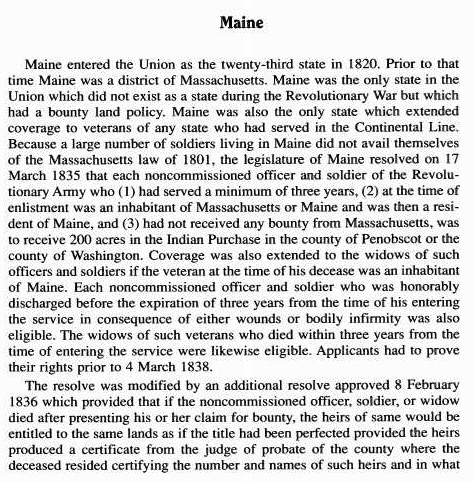 In Maine, claims had to be proved before 1840. 19 Dec 1859 – the certificate was issued from the Commonwealth of Massachusetts. 21 Feb 1860 – There is another brief affidavit signed by Charles J[arvis] Webber [son of Jeremiah Webber and Belsora Horn] who says he is a grandson of Charles Webber. 22 Feb 1860 – Another affidavit signed by Oliver A. WEBBER who says he is a grandson of Charles Webber. Martha Ballard made several entries on the Webber family in her diary. She mentions that Charles Webber buried his child on 6 December 1787; Joseph Webber of Vassalborough drown, 16 November 1795 (p. 351); that she was informed of the death of “widow Smiley of Vassalborough,” 1 February 1804 (p. 628). Charles Webber is probably the “Webber ___*” enumerated in 1790 in Lincoln County, Vassalborough with 1 male over age 16, 6 white males under age 16, and 5 white females (1790 Census of Maine Annotated Editions , p. 47), Children: “The Webber Records” (Maine State Library). Burials at Cross Hill Cemetery,Vassalboro; Village Cemetery, North Vassalboro; and Webber Cemetery, Vassalboro, respectively ( MOCA 4:2655 and 2684). Marriages/intentions in VR Vassalboro. One other place and kind of worship will not be forgotten so long as the links of tradition can touch each other — the church and teachings of Charles Webber, who resided on the river road near Riverside, in the house now occupied by Wallace W. Gilbert. Across the road, on what is known as the James S. Emery place, Mr. Webber erected a small edifice in the last few years of the last century. Here he had preaching of his own, and constituted himself the pastor. What was more conspicuous in this arrangement was the fact that said Webber could not read, and depended upon his wife for that important attribute. He could readily grasp the scripture reading of his wife and give wholesome explanation thereon; and only once was his knowledge clouded, when his wife read “log” for “lodge” in the wilderness. His manner of announcing a text was: ” If Polly tells me aright you will find my text, etc.” He urged sinners to repent, often saying that it was as impossible for one to enter heaven as it was for a shad to climb a tree. His eccentricities and goodness survive him, as does the old church, which, on another site, is the residence of Freeman Sturgis. 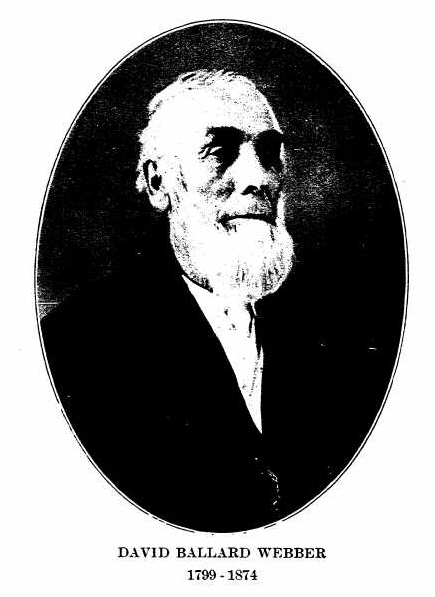 Isaiah Hawes, born in 1827, is the only son in a family of twelve children of Isaiah and Desire (Collins) Hawes. Isaiah, sen. (1777- 1852), was the son of Eben Hawes, of Yarmouth, Mass., and came to Vassalboro in 1809. His brother. Prince Hawes, father of Rev.’ Josiah T. Hawes, of Litchfield, came from Yarmouth, Cape Cod, in 1802. The present Isaiah Hawes married Lucy T. Hatch and has five children: Edwin A., Delia C, William I. (now in California), Harry P. and Alice M. Their residence was built by Dea. James Thacher, on the farm where the original Charles WEBBER first settled. Riverside. — This poetical name applies to the southwest portion of the town [of Vassalboro], embracing one of the prettiest farming districts of the county. In allusion to Benjamin Brown, the first postmaster and a prominent citizen, the community and post office was long known as Brown’s Corners. The early settlers on the river front lots from the Augusta line to Isaiah Hawes’ present residence were: William Brown, Jeremiah and William Farwell, Charles WEBBER (who came in 1765 and whose daughter, Sarah, was the first white child born in town), Benjamin Brown, Jacob Faught, Thaddeus and William Snell, Mr. Fallonsbee, James, Jonathan and Heman Sturgis and their father, Edward, from Barnstable, Mass., about 1780; James Thatcher, from Cape Cod, and Isaiah Hawes, also from the Cape. These people lived on the river road and from south to north in substantially this order, beginning with William Brown on lot 51 of the first range, where Wallace Weeks now lives. Oliver A. WEBBER had 84 first cousins, 42 of whom I’ve identified so far. She also was the first white child born in Vassalboro. Sally’s husband Judah Chadwick was born 9 Dec 1765 in New Bedford, Bristol, Mass. and went to Maine with the rest of the family. His parents were James Chadwick (1725 – 1786) and Ruth Hatch (1729 – 1796). Judah first married Deborah Ward in 1783. Deborah died in 1795. He married 11 Dec 1796 Harlem (China) Maine to Sally Webber. 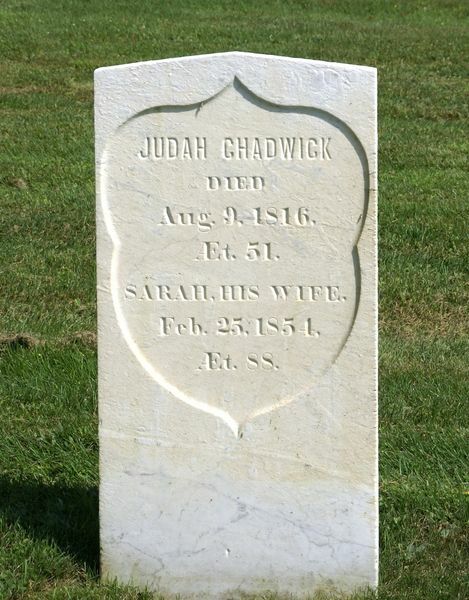 Judah died 9 Aug 1816 in China, Kennebec, Maine and is buried in the Chadwick Hill Cemetery. In 1774, when only Indians were inhabitants of all the lands east of the Kennebec, one John Jones, a surveyor, and withal a man of great daring and perseverance – familiarly known as “Black Jones” laid out a new township to the east of the Kennebec, embracing most of the land now known as China, and called it Jones’ Plantation. In the summer of that year Jones had induced 4 brothers – Edmund, Jonathan, Ephriam and Andrew Clark to come from Nantucket and settle as pioneers on his plantation. They settled on the west side of the pond near the narrows. They were soon followed by other families, the Fishes, Burrells, Ward and others. These latter settled towards the head of the lake. When the Chadwicks settled in Jones’ Plantation the 4 Clark families were the only inhabitants of the town. The part of the town to the south of the narrows was as yet unoccupied. In 1782 several families moved from the towns in the southern part of Massachusetts, notably from the cape towns – Falmouth, Barnstable, Dartmouth and Scituate all furnished their quotas. It was at this time in the spring of 1782 that James and Ruth Chadwick with their then unmarried children, Job, Ichabod, Elizabeth, and Judah moved to the new settlements on the extreme end of Jones’ Plantation. But the married sons John and James with their families followed the year after their parents departed taking with them their youngest brother Lot, who, being too young to endure the hardships of pioneer life, had been left with his grandmother, Elizabeth, when the parents went to the new settlement. About the time James and Ruth moved to Maine other families went from Falmouth to Jones’ Plantation, either with them, or soon after; among them the Hatches, Weeks, Hamlins and others. These families were all closely related to the Chadwicks by marriage. James married a Hatch, two of his sons married Weeks and one a Hamlin. How these settlers removed to their new fields we are not told; but they probably went by sailing vessels to and up the Kennebec as far as it was then navigable. It is said that when James, Jr. moved his family in 1783 he transported his earthly all in an emigrant’s wagon drawn by oxen. i. Lucinda Chadwick b. 1794, Palermo, Waldo County, Maine; d. 12 Sep 1861 Palermo, Waldo, Maine; m. Samuel C. Tucker (1795 – 13 Jun 1857 Greeley Corner Cemetery Old, Greely Corner, Waldo County, Maine). A grandson of Mrs. Tucker’s is Maj. Tucker, of the U. S. Army, who married the only daughter of Gen. John A. Logan, of Illinois. In the 1860 census, Samuel and Lucinda Tucker were farming in Palermo, Waldo, Maine with daughters Malinda (b. 1832) and Ellen (b. 1837) so perhaps the 1857 Samuel C. Tucker headstone belongs to someone else. ii. David Chadwick b. 1796, Maine; d. 17 Jun 1829 Kennebec County, Maine; m1. 17 June 1819 to Mary V. Chapman (b. 1792 – d. 4 Jan 1824); m2. 14 Dec 1828 to Caroline Bolton (b. 1804 Maine – d. 1876 Presque Isle, Aroostook, Maine) Her parents were Savage Bolton and Mary Shaw. vi. Saphronia Chadwick m. Nathan Freeman. vii. Corydon Chadwick b. 5 Mar 1805 in Maine; d. 1 Jun 1876 in China, Kennebec, Maine; m. Cyrene Hamlin (26 Oct 1803, China, Kennebec, Maine – d. 12 Apr 1891 Augusta, Kennebec, Maine) Corydon held town offices many years; Representative two years; State Senator two terms; Methodists. In the 1860 census, Corydon and Cyrena were farming in China, Kennebec, Maine. viii. Caroline Chadwick b. 10 Dec 1806 Maine; d. 27 Oct 1883 Chadwick Hill Cemetery, China, Kennebec, Maine; m. Abram Long (Feb 1808 – 14 Nov 1882 Chadwick Hill Cemetery, China) In the 1850 census, Abel and Caroline were farming in China, Kennebec, Maine. Caroline’s mother Sarah (age 84) was living with the family. ix. Joseph W Chadwick b. Oct 1808 Maine; d. 10 Jul 1836 Chadwick Hill Cemetery, China, Kennebec, Maine Aged 27ys 9ms; Betrothed to Susan Starrett sister of Elizabeth, wife of Abel. Polly’s husband John Gaslin (Goslin, Gazlin) was born 19 Jul 1766 in Vassalboro, Kennebec, Maine. He married Polly 10 May 1791. After Polly died, John married Hannah Leeman 23 Aug 1851 in Vassalboro. John died 25 Apr 1857 in Vassalboro. Mary had 12 children according to Concerning the Cortright and Webber families in America 1925, I’ve only found record of 8. Polly was buried at Cross Hill Cemetery, Vassalboro. In the 1850 census, William and Jerusha were farming in Augusta, Kennebec, Maine. ii. Thomas Gaslin b. 24 Jan 1795 in Vassalboro, Kennebec, Maine; d. 26 Jun 1877 in Oak Grove, Anoka, Minnesota; m. 1 Aug 1813 Vassalboro, Maine to Hannah M Nickels In the 1850 census, Thomas was a farmer in Readfield, Kennebec, Maine. By the 1860 census, Thomas was farming in Oak Grove, Anoka, Minnesota next to his 23 year old son Joseph. In 1814 the British fleet hovered on the coast of Maine. Vassalboro raised companies by enlistment. A small company was raised for Lieutenant Colonel Moore’s regiment, and the captain was Jeremiah Farwell; lieutenant, Aaron Gaslin [Charles’ cousin]. Charles WEBBER, Eli French, John G. Hall and Elijah Morse were sergeants; Benjamin Bassett, Nathaniel Merchant and Heman Sturges, corporals; John Lovejoy, musician; and the file of privates numbered thirty men. 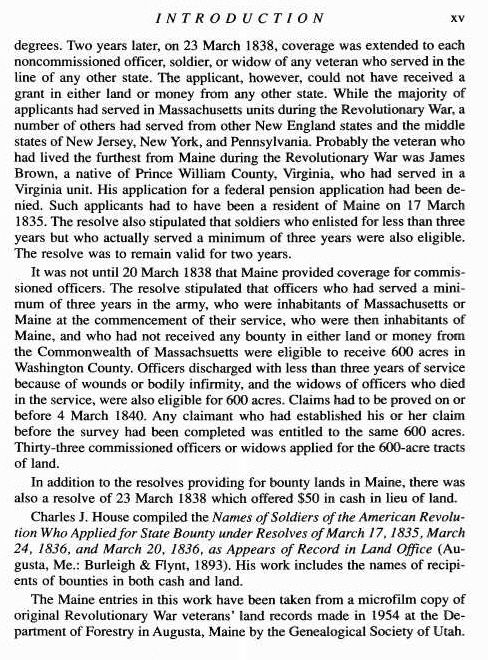 In the 1830 and 1840 censuses, Aaron was farming in Vassalboro with 9 in his household..
v. Benjamin Gaslin b. 31 Aug 1799 in Vassalboro, Kennebec, Maine; d. 10 Feb 1873 in Augusta, Kennebec, Maine; m1. in 26 Dec 1823 to Bathsheba Fuller (1785 Mass. or 1790 Maine – 2 Jan 1861 Augusta, Kennebec County, Maine; Burial Mount Pleasant Cemetery); m2. in 1861 to Nancy S. Miller (1818 Maine – 20 Mar 1872 Augusta, Maine; Burial: Mount Pleasant Cemetery). Notice that Bathseba was much older and Nancy much younger than Benjamin. In the 1850 census Benjamin and Bathskeba were living in Augusta, Maine where Benjamin was working as a trader. vii. Joshua Gaslin b. 1807 in Vassalboro, Kennebec, Maine; d. 25 Jul 1852 in Chicago, Illinois; m1. 10 Jan 1828 in China, Kennebec, Maine to Pamela Cleaves (1806 – 1833); m2. 1835 in Jackson Plantation, Franklin, Maine to Lydia Keene (1817 – 1876) In the 1850 census, Joshua and Lydia were living in Jackson Plantation, Maine where Joshua was a laborer with seven children ages 3 to 14 at home. viii. Mary W Gaslin b. 1809 in Vassalboro, Kennebec, Maine; d. 7 Nov 1890 in Windsor, Kennebec, Maine; Burial: North Windsor Cemetery; m. 6 Nov 1831 in Windsor, Kennebec, Maine to Leonard Hallowell (11 Nov 1811 Windsor, Kennebec, Maine – 9 Feb 1895 Windsor, Kennebec, Maine; Burial: North Windsor Cemetery); nine children. In the 1850 census, Leonard and Mary were farming in Windsor. James wife Susanna Woodman was born 26 Oct 1778 in New Gloucester, Cumberland, Maine. Her parents were Joseph Woodman and Susanna Stubbs. She married James 23 Oct 1795. Susanna died in 28 April 1806 in Vassalboro, Kennebec County, Maine, at age 27 years, 6 months and 2 days. James died in 1823 in Sandusky, Erie, Ohio. James had 8 children. There is a 1820 census record for a James Webber in New Haven, Huron, Ohio, about 30 miles south of Sandusky. This household had a male over 45 and a female age 16-25. Woodman, J.H.. A List of the Descendants of Mr. Joshua Woodman, who settled at Kingston, N.H., about 1736. Brunswick, Maine: J. Griffin, 1856. states that Susanna had four children. I wonder if James married a second time and had four more. Sandusky , the county seat of Erie, is one of Ohio’s most popular tourist destinations. The city is home to the Cedar Fair Entertainment Company, a regional leader in amusement parks and entertainment, as well as its flagship amusement park, Cedar Point. Cedar Point features the second largest collection of roller coasters in the world as well as many current and former record holders. The generally accepted theory is that the name “Sandusky” is an Anglicization of the phrase San Too Chee, meaning “cold water.” A less accepted theory is that the city was named after a Polish fur trader by the name of Antoni Sadowski or Jacob Sodowsky. The Greater Sandusky area was a safe haven and a new start for refugees of the Firelands, from the battlefields of the Revolutionary War in Connecticut. Established as Portland in 1816, the name was changed two years later to Sandusky. i. James S. Webber, b. 1799 in Belfast, Waldo, Maine; James was living in Oakland Michigan in the 1840 census; d. 9 Jul 1882 in East Saginaw, Saginaw, Michigan; m1. 1819 Phebe Smith ( – 1845); m2. in 1846 to Adelia (Delia) Melissa Harroun (14 Mar 1809 in New York – 22 Nov 1896 in Saginaw) In the 1850 census, J S and Dilia were living in Milford, Oakland, Michigan where James was a merchant. In the 1889 city directory, Delia was a widow living at 424 S. Warren, East Saginaw, Michigan. ii. William B. Webber b. 1804 in New Gloucester, Cumberland, Maine; m. 1826 to Ann Haskell and moved to Bangor, Maine In the 1860 census, William B and Ann W were living in Bangor Maine with four children. By the 1870 census, William had married Susan [__?__] (b. 1812 Maine). William and Susan Webber were still living in Bangor in the 1880 census where William was still working as a city cryer at age 78.
iii. Solomon R. Webber b. 1808, Maine; d. 17 Aug 1891 Melrose, Mass; m. 21 Sep 1831 in Hallowell, Maine to Eliza Ring (b. 1811 Edgecomb, Maine – d. Aft 1880 census ) Her father was Aaron Ring of Edgecomb” (VR H 6:114); g.s. Hallowell Village Cemetery; In the 1850 census, Solomon was a tailor in Portland, Maine. In the 1880 census, Solomon was a retired merchant living with Eliza and two daughters in their twenties in Melrose, Middlesex, Mass. John’s wife Lucy Ballard was born 22 Oct 1775 in Vassalboro, Kennebec Maine. Her parents were Jonathan Ballard and Alice Moore. She married John 1 Dec 1793 Vassalboro, Kennebec, Maine. Lucy died 30 Oct 1861 in Plymouth, Huron, Ohio. In the 1860 census, Lucy (age 84) was living with her son David’s family in Plymouth, Richland, Ohio. 30 Jun 1789 – Jonathan Ballard, late of Vassalborough. Alice Ballard, of Vassalborough, widow, Adm’x, 21 Sep., 1778 . [II, 84.] Thomas Town, of Vassalborough, and Ephraim Ballard, of Hallowell, sureties. Inventory by Abiel Lovejoy, Nehemiah Gatchel and Levi Moore, all of Vassalborough, 9 Dec., 1778 . [II, 148.] Darius and Calvin, minor sons, and Alice, minor daughter, chose Charles Webber, of Vassalborough, to be their guardian, June, 1789. [IV, 54-55.] Account of Alice Williams, Adm’x, filed 30 June, 1789 . [IV, 56.]. http://sonic.net/~prouty/prouty/b394.htm. 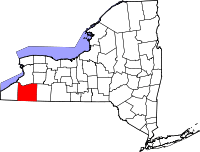 Huron county is the center of the Firelands or Sufferers’ Lands tract was located at the western end of the Connecticut Western Reserve in what is now the U.S. state of Ohio. The land was set aside for residents of the Connecticut towns of Danbury, Fairfield, Greenwich, Groton, New Haven, New London, Norwalk, and Ridgefield who lost their homes in 1779 and 1781 due to fires set by British forces during the American Revolutionary War. In 1792, the Connecticut legislature set aside 500,000 acres (2,000 km²) for the Sufferers at the western end of the Western Reserve. About 30 towns, cities and villages ended up being situated in the Firelands near the southern shore of Lake Erie. However, very few of the original “Sufferers” ever settled in the Firelands, as the land was not given for settlement until many years after the war. Even then, the land was not readily hospitable due to Indian hostilities prior to and during the War of 1812 and the necessity of clearing dense forests from most of the land so that it could be used for farming purposes. On April 15, 1803, the Sufferers, or their heirs, legal agents, and purchasers of their deeds, formed a corporation to manage the lands to which they were entitled in the newly formed state of Ohio. The land was divided into 30 five mile square survey townships, which were further subdivided into 120 quarters, each containing 4,000 acres. 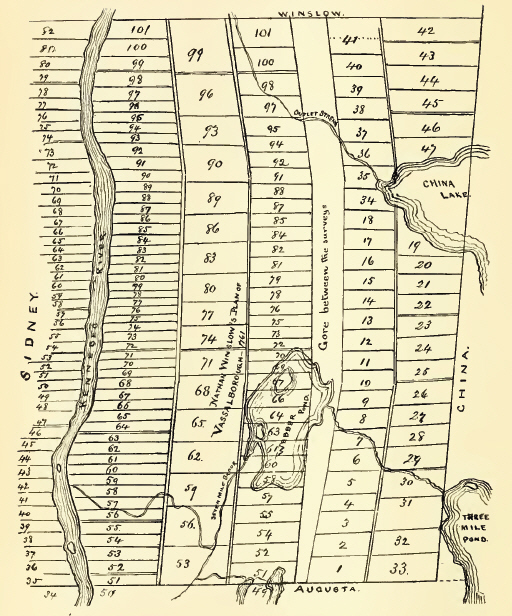 A drawing was held to determine the land received by each individual. Many of the local communities and townships in the Firelands are named for locations in Connecticut. In 1809, Huron County was formed from the entire Firelands. For the next 30 years, all of the Firelands would lie within Huron County. iv. Betsy Ann Webber b. c. 1800 m. Chame Webb. v. Stephen Webber b. 1801 Maine; m. Harriet G. Clay (b. 1814 Maine – d. Aft 1880 census Gardiner, Maine) In the 1850 census, Stephen and Harriett were farming in Gardiner, Kennebec, Maine where they continued to live through the 1870 census. x. Sumner P. Webber b. c. 1810, Maine; d. 3 Oct 1877 in Charlotte, Eaton, Michigan; m. Almeda Mann (b. Mar 1818 Ohio – d. Aft 1900 census, Denver, Colorado at the home of her daughter Caroline Green); In the 1850 census, Sumner was a merchant in New Haven, Huron, Ohio. In the 1860 census, Sumner was a prosperous miller in Eaton, Eaton, Michigan. In the 1850 census, Dyer was a merchant in New Haven, Huron, Ohio. In the 1860 census, Dyer was a teacher at the union school in Carmel, Eaton, Michigan. In the 1870 census, Dyer was a store clerk in Charlotte. In the 1880 census, Dyer was a Justice of the Peace in Charlotte, Eaton, Michigan. 6. William Webber and Mary Sturgis? William had no children. Joseph’s wife Mary Brown birth is not known. They married 25 May 1800 in Salisbury, Essex, Mass. In Jun 1802, Samuel was charged with assault in Kennebec County Supreme Judicial Court. In 1831, at the age of 52, Samuel Webber moved his family as far west as Angelica in Allegany County then came to the Tuna Valley, buying land on lot 41, just north of his son-in-law Aaron Kellogg. Samuel Webber made the first substantial improvements in town, his family coming as soon as he had provided a home. This was first a rude shanty, but the following year was replaced by the first frame house in town. In the 1850 census, Samuel and Jerusha were living in New Hudson, Allegany, New York next to their widowed daughter Meletiah Arnold. Samuel age 81 and Jerusha were still farming in Caneadea, Allegany, New York in the 1860 census. 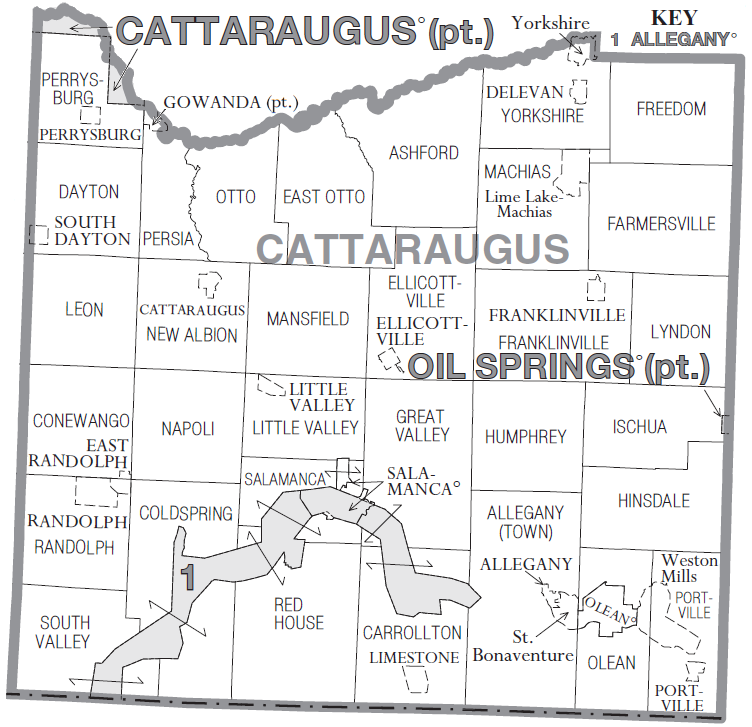 Aaron’s eldest son, Franklin Augustus Kellogg was the first child born in town according to the History of Cattaraugus County and the author’s source was Aaron Kellogg himself. In 1831, the first religious meeting in Carrolton was held at the house of Aaron Kellogg, that b eing the most roomy house in town at that time. No further church activity existed in town after that until 1843 when a class of Methodists was formed. In 1842 Aaron Kellogg was appointed one of three assessors. After the death of her husband in 1883, Charlotte left Limestone and removed to Nebraska. There she lived with her son, John Jay Kellogg, and also bought forty acres from her son Guy Irvin Kellogg Feb 14, 1885. Hannah’s husband Amos Childes was born in 1764 in Hallowell, Kennebec, Maine. His parents were David Child and Mehitable Damon or Jonas Childs and Peggy [__?__]. He first married Esther Alexander and had five children. He married Hannah 1 Feb 1801. Amos died in 19 Feb 1847 age 83 years. Amos was fifteen years older than Hannah and qualified for a a land grant from the state of Maine for Revolutionary War service. In 1841, Amos was one of twelve Revolutionary War pensioners in Vassalboro. In Jun 1805 Amos was a defendant in Kennebec County Supreme Judicial for illegal drink sales. Court In the 1820 census, Amos was living in Wilton, Kennebec, Maine with a wife, two boys and two girls. By 1830, the family had grown to seven children. iii. Mary Sophia Childs b. 22 Nov 1794 Vassalboro; d. 5 Aug 1877 Newcastle, Northumberland, New Brunswick; m. William Fish (b. 1789 in Sandwich, Barnstable, Mass – d. Newcastle, Northumberland, New Brunswick) His parents were Eliab Fish and Abigail Swift. v. Paulina Childs b. 20 Aug 1802 in Vassalboro, Kennebec, Maine; d. 25 Mar 1875 in Vassalboro; m. Sep 1822 in Vassalboro to Enoch Plummer (1794 NH – 1883 Vassalboro, Maine) In the 1850 census, Enoch and Paulina were farming in Vassalboro. George’s second wife Temperance Emery was born in 1779 in Maine. 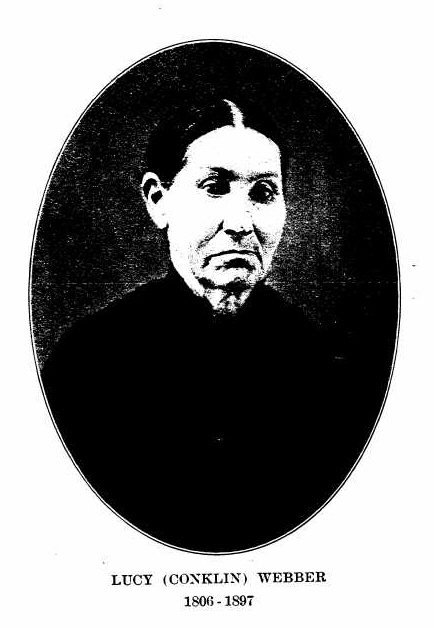 In the 1850 census, she was living with Thaddeus Snell and his wife Melinda Emery in Vassalboro. In 1814 the British fleet hovered on the coast of Maine. Vassalboro raised companies by enlistment. One was raised for Lieutenant Colonel Moore’s regiment, and the commissioned officers were: Daniel Wyman, captain; Alexander Jackson, lieutenant; William Tarbell, ensign. Thomas Hawes, Daniel Whitehouse, Zenas Percival and Roland Frye were sergeants; John Clay, Gersham Clark, Thomas Whitehouse and Jonathan Smart, corporals; George Webber, musician. There were twenty-nine privates. George married Sybil Webber 7 Nov 1800 and Temperance Emery 11 Dec. 1820 Vassalboro, Kennebec, Maine. In the 1820 census, a George Webber was living in Vassalboro with a wife, three daughters and one son. In the 1830 census, a George Webber about the right age was living in Vassalboro with a wife and three daughters. George had 4 children. i. William W. Webber was born in 1805 in Maine; An ancestry.com family tree says his parents were Capt. George Webber (1776 – 1833) and Sybil [__?__] (1780 – 1828), but this genealogy says he was born in Monmouth, New Jersey in 1800. m. Rozilla L. Rollins. In the 1850 census, he was a farmer in Augusta, Kennebec, Maine. Rosilla M. Rollins was born 13 Jan 1804. Her parents were Ichabod Rollins and Mary Rawlins. a. Caroline Sarah Webber b 1829 in Vassalboro, ME; d 29 Dec 1892 & buried in Bolton Hill Cem. in Augusta, ME. She was married 17 Sep 1848 to Joseph Andrew Shaw. Benjamin’s first wife Lydia Hannah Bailey was born 27 Feb 1788 in Pittston, Kennebec, Maine. Her parents were Nathaniel Bailey and Sarah Goodwin. She married Benjamin 27 Jun 1805 Pittston, Maine. Lydia died 1834 in Maine. Benjamin married his second wife Lacina [__?__] in 1834.
i. Pamela (Parmelia) Webber b. abt 1810 in Maine d. 7 Jun 1881 in China, Kennebec, Maine; m. 27 Nov 1827 in Vassalboro, Maine to Levi Jackson (1801 in Sidney, Kennebec, Maine – 3 May 1881 in China, Kennebec, Maine); 11 children In the 1850 census Levi and Pamela were farming in China, Maine. By the 1880 census, Levi and Parmelia were retired and living with Levi Jr. in China. The Chadwick Family of Jones’ Plantation in Maine. Compiled by Lillian Rich (McLaughlin) Gilligan, 1931. This entry was posted in -8th Generation, 90+, Line - Shaw, Place Names, Veteran and tagged 2nd Lt 2nd Lincoln County Regiment 1776, Vassalboro Pioneer. Bookmark the permalink. I’m looking for a missing Webber too. My last Webber is Oliver Webber (1797 – 1862) . He lost four boys to the Civil War: two killed, one wounded and one broken. I have twin sisters and we must get our twin genes from him his daughter Ellen (Emma’s twin) is our ancestor. The article does not state the writer? I am curious as to where the writer sees the descendants of Lewis, Ephriam, John who appear in the early census records of Jones plantation later China maine?In the 1840 census along with John, Ephriam and the others is listed a Benjamin Webber right in age to be the same Benjamin who married Elvira Hussey who you show attached to the Charles line…..could these two Benjamins be one in the same……….? Also, I do have a letter post marked from James S Webber of Saginaw, Michigan to Benjamin F Webber at a Waldo, Me post office….so I am sure that Benjamn was related to the descendants of Charles….but…could the Webbers of China, Me be descendants of another brother to Charles? Who are the China, Me Webbers of the early 1820 and forward census records? I communicated with a descendant at the Webber forum in the past who said she was related to Parmelia Webber daughter of Benjamin Webber and Lydia Bailey…She said that Lavina Webber b. 1808 as you show it, died the same year that Benjamin Webber and Elvira Hussey Webber had their first daughter in April 1851…So they named their first daughter Sarah Lavina Webber…I will try to find a death record for Lavina Webber b. 1808? Or does someone out their have a death record or knowledge of the Lavina Webber b. 1808….Would love to communicate with any descendants of Parmelia Webber and Levi Jackson…. I found Benjamin and Elvira’s 1860 census record and they had a daughter Sarah born in 1851. A link to a 1900 census record shows that Sarah’s middle initial was indeed “L”. She married Dr. Onslow M Kingsbury in 1874 and Elivra (age 75) was living with her daughter and son-in-law in Georgetown, Sagadahoc, Maine. In the 1880 census, she went by Vina S Kingsbury so its clear her middle name was a very important part of her identity. I a searching for a Frederick Webber who came to Alabama had a child and as story goes was sent back up state to a family he had already started not sure of the state. Also heard he was a Tailor. Need help. Please Email me at bamabella66@yahoo.com. Ty. Karen.